This project enhances existing collaborative efforts to improve water quality and reduce nutrient loss in the Rock Creek Watershed in the Upper Cedar River Watershed, in portions of Mitchell, Floyd, and Worth counties. The Rock Creek Watershed is a 44,787-acre watershed dominated by 87 percent row crop agriculture. It drains to the point where Rock Creek meets the Cedar River southwest of Osage, Iowa. Local farmers and stakeholders have developed a watershed plan that includes edge-of-field practices such as bioreactors and saturated buffers. 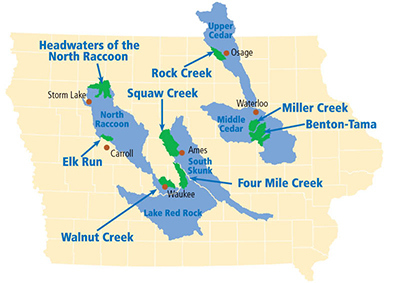 When completed, the watershed will have the largest concentration of these practices in Iowa. The plan calls for 25 bioreactors and/or saturated buffers in the area. This effort will serve as a pilot site for new and innovative ways to expand implementation of these practices to other areas of the state.